The Pipestone Youth Orchestra continues to wow audiences with its performances, and having completed the winter concert cycle is now preparing for the Pipestone Music Days Concert, which will take place on Saturday evening, May 17 in the Twisp Community Center Gym. 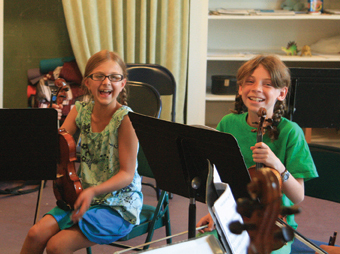 Boasting eight young string players this year, the group is “small but mighty” and plays with the heart of a major orchestra, said conductor Tara Kaiyala Weaver. Weaver welcomes additional members. “My dream is still to have a full Youth Symphony Orchestra complete with winds, brass and percussion. Having grown up in Seattle’s Little Symphony, Junior Symphony and Youth Symphony Orchestras, It would be terrific if all school band students and string players would join this group – we could fill the house with great music!” Weaver said. REHEARSAL TIMES/DAYS: Each Monday, 3:30-4:45pm LOCATION: Methow Valley Elementary School band room. CONTACT/INFO: 509.341.4194 or 509.997.0222.